The folks at CD Projekt RED aren't fond of DRM or QTEs either. "There's no place for multiplayer in so strongly a story-driven game as The Witcher 3: Wild Hunt," says CD Projekt RED's head of marketing, Michal Platkow-Gilewski. Instead, CD Projekt RED would prefer to concentrate on creating a perfect single-player experience, "delivering more than 100 hours of truly immersive gameplay," Platkow-Gilewski promises, in a world that's designed to be 36 times the size of that in The Witcher 2. After all, thinks CD Projekt RED, telling a story is an art form; it's hard enough to do without trying to keep multiple Geralts happy. Nor are QTEs welcome at the CD Projekt party; they've been removed completely from The Witcher 3. CD Projekt came to the conclusion that QTEs usually frustrated players, and really only work in a specific set of circumstances. "There is a small number of games where it is fun," says project lead Konrad Tomaszkiewicz, "like, for example, in the Uncharted series, where you don't even realize that you've just finished a QTE sequence." But what works for Uncharted won't work for an RPG, hence why CD Projekt feels the immersion-killing QTE has no place in The Witcher 3. CD Projekt hasn't changed its stance on DRM, you'll be pleased to hear. "DRM is the worst thing in the gaming industry," Tomaszkiewicz went on to say. "It's limiting our rights to play games owned by us." It's just punishing legal users, he says, and does nothing to deter piracy. Even The Witcher has its share of pirates, but Tomaszkiewicz takes comfort in the fact that Witcher fans actively persecute people who download Geralt's adventures via torrent. "Our fans out there really appreciate that we trust them," says Tomaszkiewicz, "and that we treat them with honesty and respect." 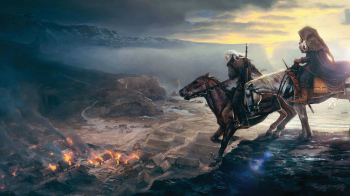 The Witcher 3 is due for simultaneous release on next-gen consoles and PC in 2014.